Intel has this week quietly announced the launch of its new Intel NUC desktop mini PCs that will soon be available equipped with Broadwell Core i3 and Core i5 processors. 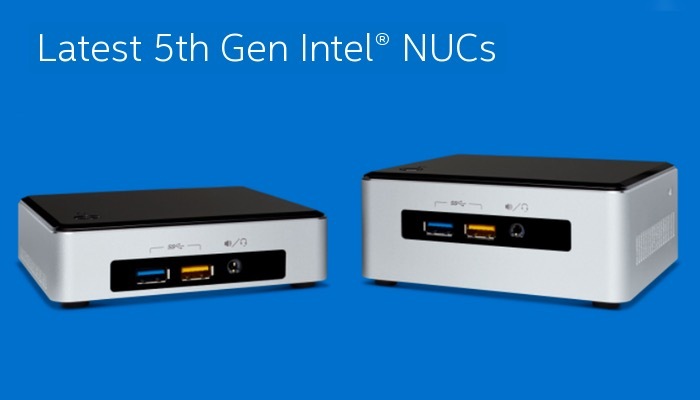 The new Broadwell Intel NUC desktop mini PCs take the form of the Intel NUC5i5RYH and NUC5i5RYK that are equipped with Intel Core i5-5250U processors supported by Intel HD 6000 graphics. The range also includes the Intel NUC5i3RYH and NUC5i3RYK mini PC that are equipped with Intel Core i3-5010U processors supported by Intel HD 5500 graphics. All four systems also sport connectivity provided by Gigabit Ethernet, 802.11ac WiFi, Bluetooth 4.0, together with the ability to install up to 16GB of RAM. The differences between the system references indicates that the RYH model has space within its case for a 2.5 inch hard drive, while the RYK is a more compact mini PC with just enough internal space for an M.2 solid state disk (SSD). Unfortunately no information on pricing or worldwide availability has been released as yet by Intel for the new Intel NUC mini PCs, but as soon as information comes to light we will keep you updated as always. However full specifications for all four new mini PCs can be found over on the Intel website following the links below.